Since the launch of Intel's first quad-core desktop processor over a year ago, there's been a conspicuous hole in AMD's product line up. But those days are over. Phenom, AMD's crucial new quad-core desktop chip, has finally arrived. Is it good enough to keep Intel's latest 45nm quads honest? Or will the focal point for AMD's shortcomings simply shift from core count to pure performance? Unfortunately, the answer is largely the latter. 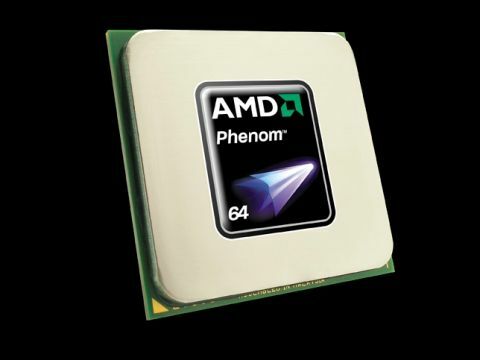 Phenom shares its basic underpinnings with AMD's new quad-core Opteron processors. But it's not an all-new design. Rather, it's a moderate revision of AMD's existing K8 CPU architecture with the maximum core count taken up to four, plus a range of detail architectural enhancements. The extra pair of cores aside, the most significant tweak is the doubling of floating point unit width to 128-bit. That allows all SSE-type 128-bit instructions to be handled in a single clock cycle rather than split in half and crunched two cycles. Intel's competing Core 2 CPU architecture has offered a comparable capability since mid-2006. Similarly, Phenom's data fetch width has grown from 16 to 32 bytes, enabling it to fetch multiple instructions in a single cycle. Again, the idea is boosting clock-for-clock performance. A range of further detail enhancements include the addition of HyperTransport 3.0 (only available when Phenom is used in conjunction with the latest AM2+ CPU socket) and DDR2 memory support boosted to 1066MHz, both in the name of increased bandwidth. AMD has also bolted on a 2MB pool of Level 3 shared cache memory. This can be shared dynamically or monopolised by a single core according to workload requirements. Finally, Phenom packs the latest revision of AMD's Cool 'n Quiet power management technology. The big news here concerns individual frequency control for each core and split power planes for the memory controller and northbridge on the one hand and the execution cores on the other. Both features give AMD more flexibility for minimising power consumption according to workload. Elsewhere, Phenom sports essentially the same instruction pipeline and the 3-issue width design as existing AMD CPUs. The architectural carryover also means the memory controller and HyperTransport bus remain on-die. That's an enormous benefit in terms of bandwidth and latency, both of which are becoming increasingly critical in the context of data-hungry multi-core processors. As with every other multi-core AMD processor, this is single-die chip and hence the world's first true, or in AMD parlance 'native', quad-core desktop CPU. Intel's quads, by contrast, are composed of a pair of dual-core dies sandwiched onto a single CPU package. On paper, the advantage of AMD's more elegant approach involves bandwidth, latencies and multi-core performance scaling. The final static feature is the 65nm silicon manufacturing process. AMD's existing 65nm dual-core processors are relatively hot and power-hungry. The disappointing 2.2GHz and 2.3GHz clockspeeds of the two Phenom models available at launch, the 9500 and 9600 respectively, are not therefore a huge surprise. Indeed, due to a last moment alteration to AMD's launch plans, the 2.4GHz 9700 model reviewed here will not now be available until early 2008. There's been some confusion at AMD regarding the reason for the delay. One story involves a hardware erratum that only shows up during extremely intensive workloads and is marginally more likely to effect higher clocking chips. The other is that it's simply a matter of production volumes and yields. Given the difficulty AMD has had shipping its new quad-core processor in Opteron form at decent speeds, we subscribe more to the latter. Whatever, we have little doubt that this chip cannot match a similarly clocked Intel 45nm Core 2 Quad processor in most benchmarks. That's despite the fact that the review system provided by AMD enjoyed all the benefits of the company's much-hyped new Spider platform and in particular the 790FX chipset complete with PCI Express 2.0 support and oodles of bandwidth from HyperTransport 3.0. Survival for the Phenom 9700, and probably AMD itself, will therefore be all about pricing. Sold at a significant discount to Intel's competing kit, the Phenom 9700 is an attractive budget-orientated quad-core alternative to the usual Intel kit. The only question is, can AMD really afford to sell its new quad-core chips this cheap. And for how long? With those kinds of frequencies, Phenom clearly doesn't stand a chance against Intel's quickest 3GHz+ quads. More relevant is that it lags behind the latest 45nm Core 2 Quad processors when matched for clockspeed, too. At 2.4GHz, Phenom can trail by more than 15 per cent. It's intriguing to note, however, that Phenom scales better from one to four cores in the Cinebench rendering test. It's confirmation of the advantages of AMD's integrated architecture. All of which leaves AMD no choice but to compete on price. Launch pricing for the 9500 and 9600 models is expected to be approximately £125 and £150, respectively, in the UK. Add in the fact that all Phenoms are backwards compatible with existing AM2 socket motherboards and you have a painless and extremely affordable drop-in quad-core upgrade proposition. More doubtful is whether you would want to use it as a base for a brand new system.